‘Samrajgad’ a.k.a. ‘Danda-Rajapuri’ is situated on a hill, south-west of the sea shore of Murud village and is near to the famous fort Janjira. It was built by Shivaji Maharaj to keep an eye on Janjira and to cut off its access from land. Samrajgad was used as the main base for the attacks on Janjira. Janjira was under the control of Siddi, who are Habshi or Abyssinians. Shivaji Maharaj sent Vyankoji Datto to build this fort. As Samrajgad is perilously close to Janjira, Vyankoji was given a platoon of Maratha soldiers for protection. Vyankoji fought with Siddi’s cavalry and captured the surrounding regions of Danda-Rajapuri. Around 300 Habshi were killed in this battle. Siddi tried to make a truce but Shivaji Maharaj did not yield. Samrajgad was built on a hill near Rajapuri. With the construction of Samrajgad, the access to Murud was cut off for the Siddi. To remove these shackles over his trade routes, Siddi attacked Samrajgad. He sent soldiers and cannons in small boats. They attempted an attack on the fort by tying cannons to palm trees, but the trees collapsed and the attack fizzled out. After this failure, Siddi planned the next attack carefully. Shivaji Maharaj had left Raigad for the conquest of Janjira. Siddi wanted to capture Samrajgad before that. The second attack was led by Siddi Khairat and Siddi Kasim. On 11th February 1671, under the cover of a dark night, Siddi Khairat attacked from the land side of the fort with 500 Habshi soldiers. It was the festival of Holi on that day and Maratha soldiers were in festive mood. They still managed to counter-attack and fought Siddi Khairat well. Meanwhile, Siddi Kasim had landed near the fort from the sea in boats. He put up ladders and ropes on the fort wall. While Maratha soldiers were busy fighting off Siddi Khairat, Siddi Kasim and his soldiers climbed up the walls and entered the fort. The Maratha army was now caught in this pincer attack. They fought hard in spite of the overwhelming odds. They were finally beaten when the stores of gunpowder caught fire and exploded. Scores of soldiers from both sides were killed. Hearing the news about explosion, Shivaji Maharaj sent his scouts to Samrajgad. By that time, Samrajgad was lost to Siddi. With this defeat, Shivaji Maharaj was forced to cancel his planned attack on Janjira. Today only the walls of citadel of Samrajgad are standing. The wall is simple, built by laying huge stones without any binding material. There are no other remains on the fort. One can see Janjira on the south and Padmadurg on the west from the fort. Murud is about 165 km from Mumbai (via Revdanda) and about 238 km from Pune (via Mahad). People travelling in private vehicles need to take Mumbai – Goa highway 17. ST buses ply regularly from multiple places to Murud. 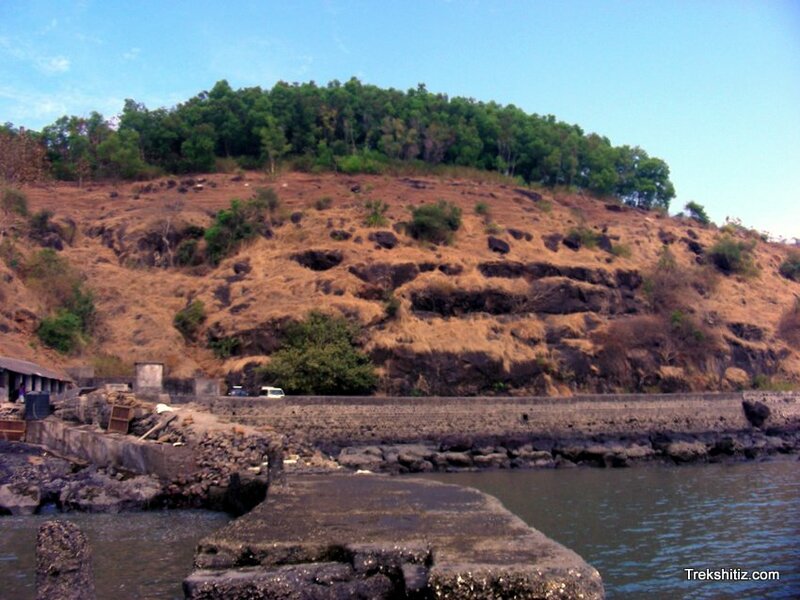 Samrajgad is situated on the south-west side of Murud town, on the way to the jetty for Janjira fort. Once we cross the bridge over the creek, we can reach the village Ekdara which is at the base of the fort. The road to the Shiva temple in the village leads to a path that goes to the fort top. It takes about 10 minutes to reach the fort from here. Murud being a famous tourist destination, many resorts and lodges are there. One can plan an extensive trip to Murud and visit Padmadurg, Samrajgad and Janjira forts along with many historical places around.